And it’s a terrible feeling. “There’s nothing special about me,” is the common refrain from these glum and anxious rising seniors. “I’m just normal and boring,” they say. I listen for a bit. And try to assure them they will find an awesome topic (because they all do!). Once they calm down, I introduce them to my sure-fire topic finding bag of tricks. I almost always start by looking for what I call their “defining qualities.” Sometimes I throw in their “defining characteristics” and “core values” as well. If you start brainstorming your topic ideas around one of your defining qualities, you automatically direct your essay writing process in the right direction, on many levels. And your essay will be focused and help you stand out from the competition! By directing your brainstorming around ONE of your defining qualities, you effectively focus your topic. Instead of trying to write about many parts of your wonderful self, and risking an overly broad and dull essay, you pick one to concentrate everything around. With this one move, you catapult your essay topic over and beyond the thousands of boring essays where students try to pack in too many ideas and information about themselves. Once you pick ONE defining quality to write about, you have a starting point to brainstorm real-life experiences and min-stories you can use to illustrate that quality. Stories are the best way to power narrative style personal essays. If you generate these real-life examples from ONE defining quality, you make sure you share only stories, experiences and moments that support your overarching point, instead of random ones that are all over the place. Will be about YOU! If you showcase only ONE defining quality in your essay, you are making certain that your essay will be about you, even if you include or mention other people from you life in that essay. A common mistake students make with these essays is to use a real-life story about someone else, and their essay ends up being too much about that other person instead of themselves. The whole point of a personal statement essay is for the college to get to know YOU, and not your grandma or teacher or tutoring student. Stick with your ONE defining quality, and you won’t need to worry too much about this pitfall. Your stories will be RELEVANT! If you start brainstorming real-life stories around your ONE defining quality, you are 100 percent guaranteed to find good ones. Think about it: If you picked ONE defining quality that is a big part of what make you unique and special, then can’t help but have had experiences and moments in your past that happened to you that were somehow related to that quality. So trust that picking only ONE quality will yield plenty of terrific ideas and experiences you can use in your essay to share, explain, analyze and reflect upon. Your essay will be PERSONAL! If you write about a defining quality, yous essay has the best chance possible of being highly personal. I believe personal essays are most effective because they engage and connect with readers, and are the most memorable. This is everything you want in a college application essay. Writing about ONE defining quality makes an essay personal because that quality is one that helps define you—meaning it plays a big role in making you who you are. What’s more personal than that? And the little moments and experiences you use to illustrate that quality will be equally personal. Hurrah!! So that should be a strong enough case to convince you to start by coming up with a list of your defining qualities or characteristics. This entire blog has helpful posts to teach you how to spin that quality into a killer essay! 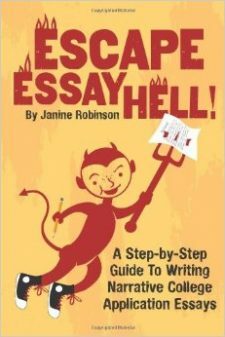 So does my writing guide, Escape Essay Hell!, and my online essay writing course. Even almost all the sample essays written by former students in my collection, called Heavenly Essays, started with their defining qualities. So what are you waiting for? Stop all your worrying and get started! Find Your Defining Qualities and Characteristics in this post! Still confused or have any questions? Ask away in the comments section. I love to hear from you!